Grim Shieldmaiden, a Nord warrior, can be the target of the recurring quest The Dark Brotherhood Forever. 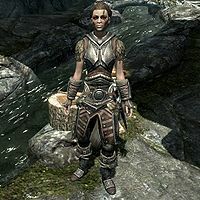 She walks a circular path around the waterwheel-powered smithy in Markarth. She wears a random set of steel armor with steel boots and gauntlets. She wields a steel sword and blocks with an imperial shield. When you approach her she will only say: "Did you want something? I'm quite busy." This page was last modified on 20 March 2013, at 04:48.